It is located at medium, 80 km to the South of Memphis, on the Westbank of the Nile, to the East of Lake Moris and the Fayum oasis. 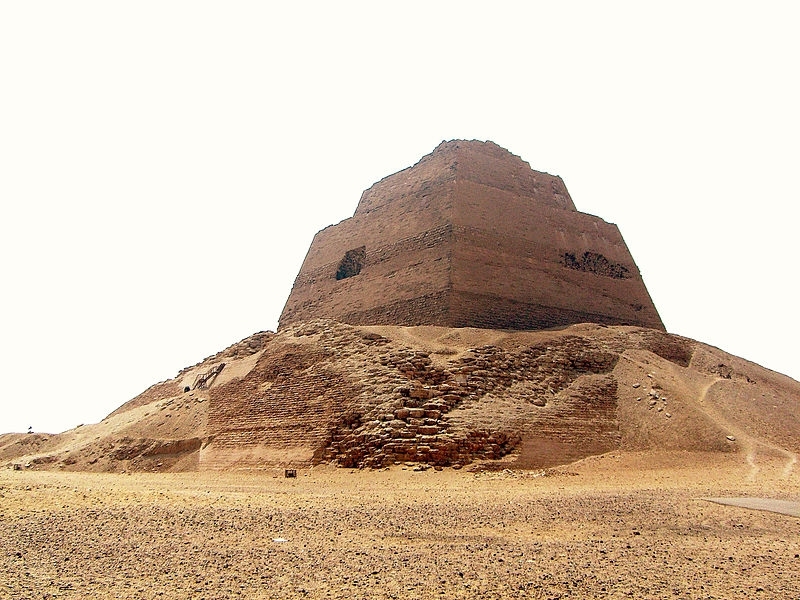 It has often been assumed that the original builder of this Step Pyramid was Huni, the last king of the 3rd Dynasty. This is, however, merely based on the desire to credit at least one major building to this otherwise elusive king. Huni's name has not been found in or near the Medium Pyramid, making it quite unlikely that this monument was built for him. The fact that the pyramid was named Snofru Endures has led others to suggest that it was Snofru who built this monument. This pyramid was built as the ancient Egyptians believe in the resurrection. The king was buried in this pyramid according to the ancient Egyptian concept of life after death. Following the tradition that was started by the funerary monument of the Horus Netjerikhet at Saqqara, this pyramid was started as a Step Pyramid. With the pyramid of Sekhemkhet at Saqqara and the pyramid at Zawyet el-Aryan, credited to Khaba being left unfinished, the one at Meidum was the second large-scale Step Pyramid to have been completed. Recent archaeological research has led to the assumption that Snofru built this pyramid before his 15th year and then abandoned the site to start a new royal cemetery at Dashur, some 40 kilometers to the North. What is certain is that Snofru at one point during his reign -and some suggest a high date such as the 28th or 29th year of his reign- ordered the transformation of the original Step Pyramid into a true pyramid. It is unlikely that Snofru usurped this pyramid since he already had built two other pyramids at Dashur. The reason why this king would have wanted 3 pyramids, making him the most productive pyramid builder in the history of Egypt, is not known. It is also not known whether the conversion of the original Step Pyramid into a true Pyramid was completed. Today there is little to suggest that this monument once indeed was a pyramid. All that remains now is a three-stepped tower rising up from a hill of debris. The internal structure of the pyramid is fairly simple, compared to its successors, but at the same time, it was an innovation that would become the standard for generations to come. The entrance is located on the north face of the pyramid, above ground level. A descending passage goes down to below ground level and ends in a horizontal passage. Two small chambers or niches open to the left and right of this passage. At the end of this passage, a vertical shaft leads up to the burial chamber which is located at ground level. This is the first pyramid to have a room inside its actual core. The burial chamber measures 5.9 by 2.65 meters, which is quite small, yet another sign that the builders were experimenting. There is no sarcophagus and no trace of a burial. Outside the pyramid, many elements that would become the standard for pyramid complexes to come were already present as well. A chapel, measuring 9.18 by 9 meters, was built against its eastern face. To the south, there was a small satellite pyramid. It has an entrance in its north face with a descending passage leading down to the burial chamber. It was already heavily destroyed when it was found. Traces of an enclosure wall, measuring some 236 by 218 meters surrounding this complex have also been found, as well as a causeway, cut in the bedrock and encased in limestone. It is clear that the transition from the Early Dynastic funerary complexes to those of the Old Kingdom. The original shape of the pyramid still reflects the 3rd Dynasty tradition, but the building complex technique, the presence of a satellite pyramid, an eastern chapel and a causeway herald the tradition of the Old Kingdom.